Screen, Visual Haze, Mark I. Stores reference 22C/872. 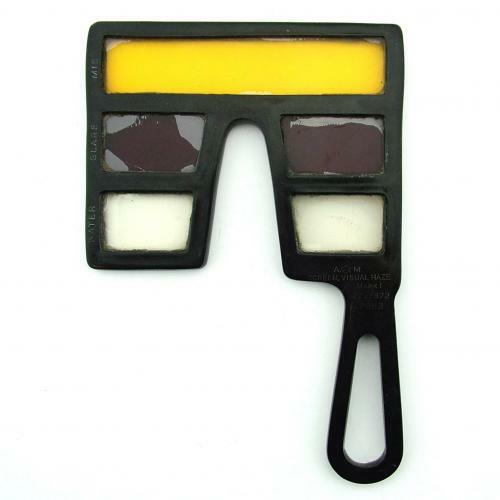 Handheld optical device with what appears to be a bakelite frame housing three rows of different coloured filters for use when viewing through 'Mist', 'Glare' and 'Water'. Integral handle. Officially classified as flying clothing the airman would hold the screen up to his face and select the appropriate filter for making observations. It would seem likely that these were used mainly by Coastal Command crews. Extremely rare to find, possibly as they are quite fragile. There is some delamination marking around the edges of the filters (mainly the pink anti-glare) but overall condition is very good. Air Ministry King's crown marked with reference numbers. Stock code GDRF1.